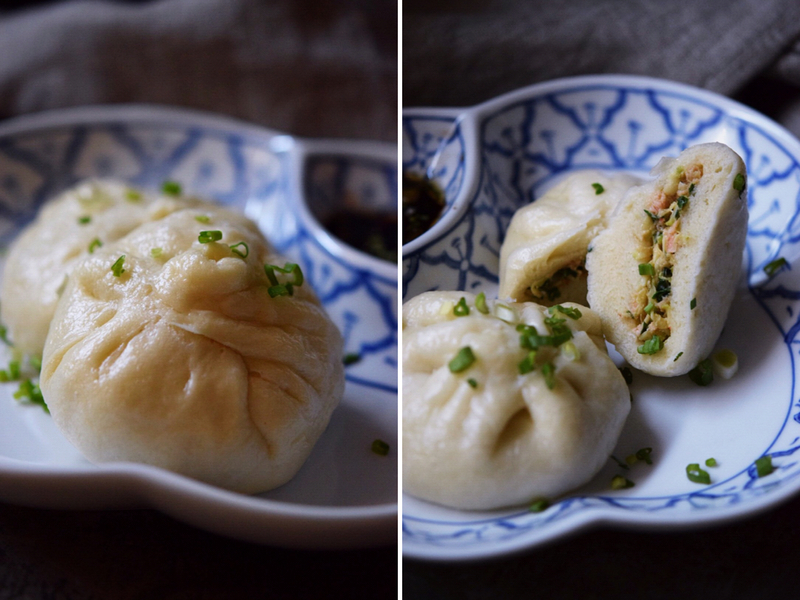 Chinese buns and dumplings are my weak point, I could win "Who Eats More" contest easily! 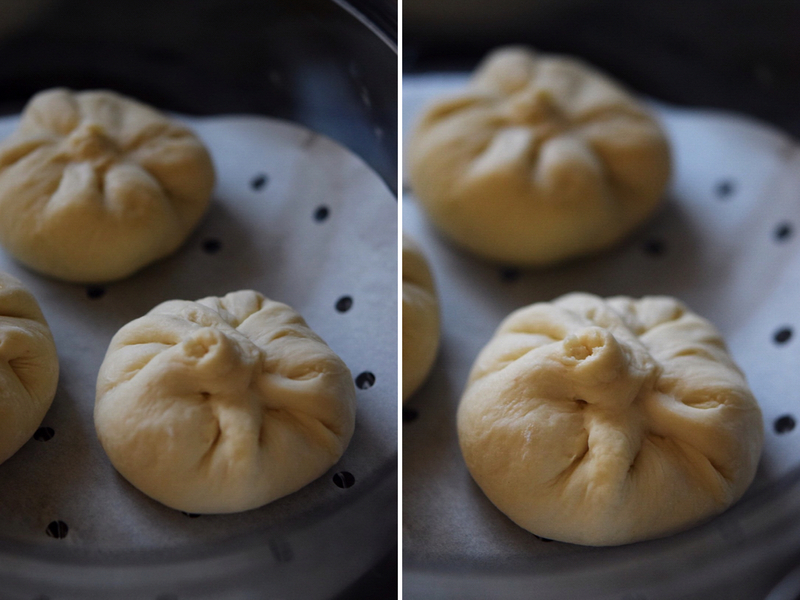 After making dumping yesterday, next I decided to make fluffy (oh, so fluffy) bao buns. 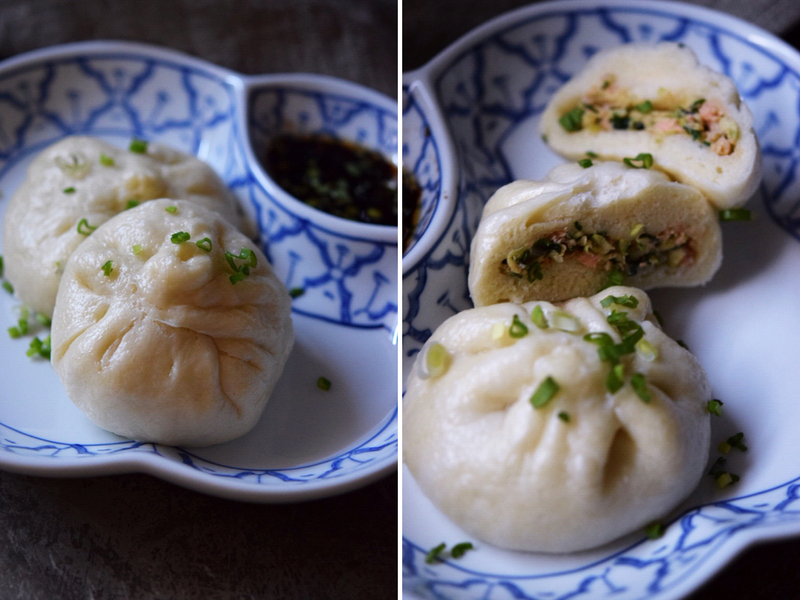 Cool think about these buns is that they can be stuffed with just about anything, even a chocolate! My plan was to make spicy stuffing with salmon and kimchi, but when I dived into my fridge to get the jar of the pickled Napa cabbage (this is what kimchi is, you can find the recipe here ), I found on my way lonely courgette and a bag of organic Swiss chard. And because these two ingredients go very well with salmon I've changed my plans. The outcome was as delicious as I thought it would be. In a small bowl mix together water and the yeast, set aside for 10 minutes, until its frothy. In a separate bowl mix together flour, sugar and baking powder. Add the yeast mixture to the dry ingredients, and stir well. Add the vegetable oil, and mix until everything comes together into a slightly shaggy dough. Knead the dough until becomes smooth and elastic, for about 10 minutes. You may need a little bit more flour, add maximum 1/4 of a cup. Transfer the dough to an oiled bowl, and cover with plastic wrap or a clean kitchen towel. Let the dough rise in a warm place for about an hour. While the dough is rising make the stuffing and the dipping sauce. To make the sauce, mix together the oyster sauce, soy sauce, sugar and water in a medium sauce pan . Bring to a boil and let it simmer for a few minutes. Add garlic, green onions and sesame oil. Mix and set aside. Make the stuffing. Place the grated courgette in a strainer over a small bowl, and squeeze all the excess juices. In a separate bowl mix together salmon, Swiss chard, green onion, garlic, ginger, oyster and soy sauce, and the sesame oil. Mix thoroughly and set aside. Don't add the courgette yet, we will do that latter. By this time the dough should have doubled in size. Kneed it lightly to expel any air bubbles. Roll the dough into a long log and cut in 12-16 equal pieces. Roll each piece into a ball, place them under a kitchen towel and let it rest for 10 min. Now its the time to add courgette to the stuffing. 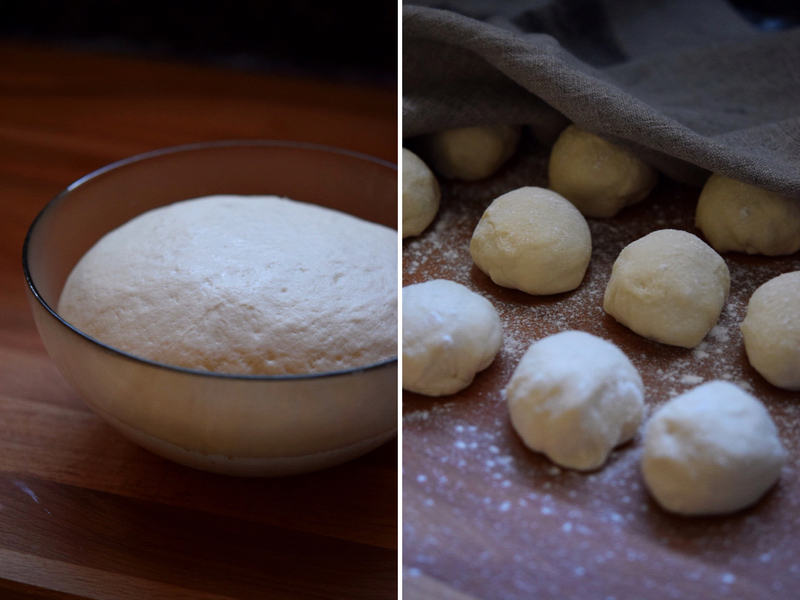 Roll each ball of the dough into a circle, try to make the edges a bit thinner than the center of the wrap, place about 1 tbsp of the filling in the center and seal the edges tightly. 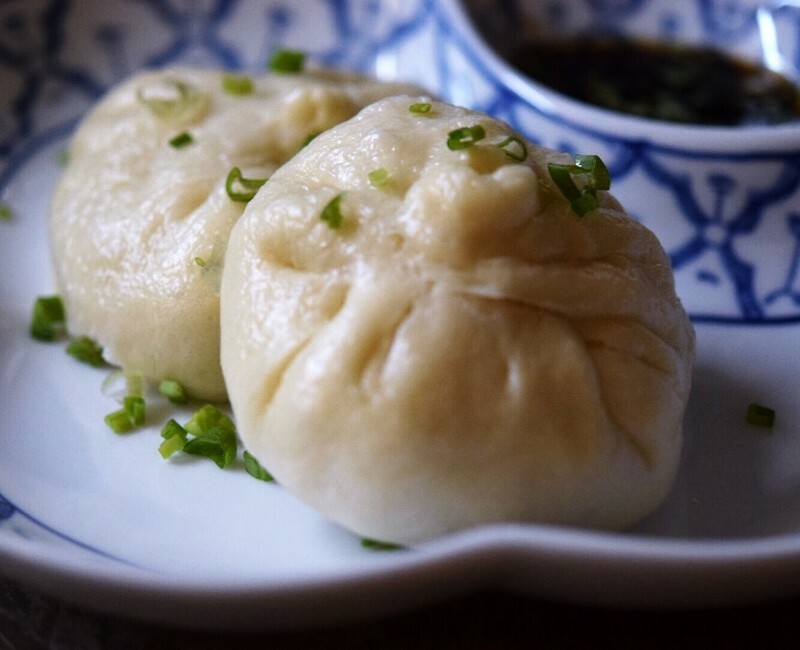 Steam the buns for about 20 min. Serve hot with the dipping sauce. 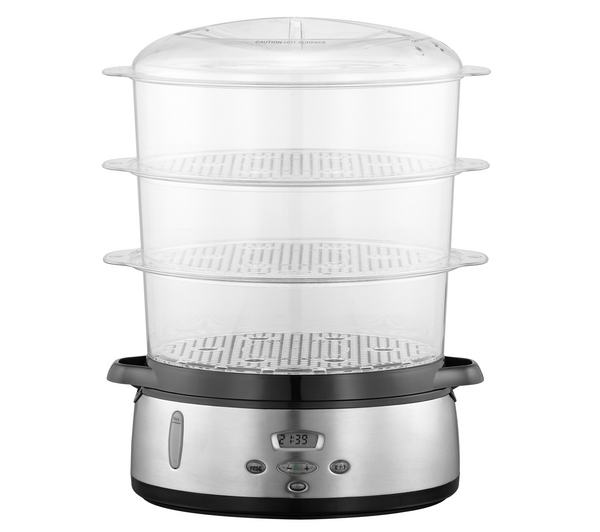 I use an electric three tier steamer (like this one) if I want to cook all the buns together. Otherwise I use the cute bamboo steamer (like this one).